I was glad when the wobbly, noisy little plane finally touched the ground and when I reached Bloemfontein, the Capitol of what was once known as the “Orange Free State”, the home of the dutch “Boer”. So it was kind of special that a dutchman like myself arrived there all dressed up in ‘orange’ robes and was greeted with a kirtan party on the airport. 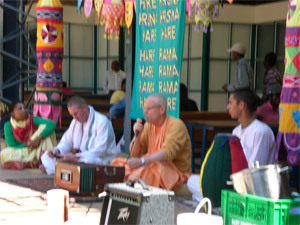 People turned their heads, the Hare Krsna movement has arrived in Bloemfontein. Rupa Raghunatha grabbed my bag and escorted me to his twenty year old Mercedez. 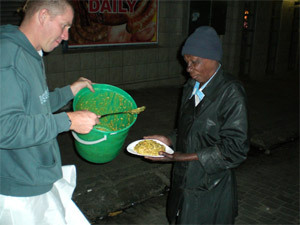 In the mid-nineties Rupa moved in to Soweto to do Food for Life, a white man working in all black Soweto, just after the “Apartheid” policy of the South African government had been abandoned. Not an easy thing. Last year, in the same revolutionary spirit, Rupa took another initiative to open up a new temple in Bloemfontein. I recently visited him for the second time. Rupa Raghunatha by the way and his wife Syama along with their family of 2 teenagers, their son Nimai and I don’t know their daughters name. Most Grhastas these days are too preoccupied maintaining their families and who in the world has time for preaching like that. It reminds of the very early days of ISKCON, when Srila Prabhupada glorified his householder preachers; they have done more than the sannyasis. Prabhupada referred to the fact that Srila Bhaktisiddhanta send his sannyasis to London to establish the sankirtana movement, but they returned without much result, but his grhasta disciples had opened temples all over the world. Bloemfontein is now a happening place with a garden restaurant, people seem to like it, 2 uni programs a week, a Wednesday night program, hari nama and Food for life. All together they are six devotees living in the temple now, there is space for more. I must say I had a good time there. They have got a nice house in a suburb with a decent size temple room. On the altar we find Deities of Gaura Nitai and Giriraja is also present. There is a daily Mangala Arati at 5am and also at 7:30am Deitydarsana guru puja and Srimad Bhagavatam class. We got a good crowd for the Wednesday program. They all liked everything the kirtana, the talk and the prasada. Bloemfontein is in the heart of South Africa, in what was known as the Orange Freestate, the homeland of the white “Boers”. 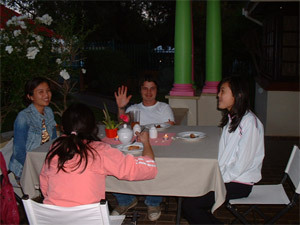 The pictures show that Rupa’s guests certainly include all kinds of people, from all kinds of races incl. even Chinese or Thai or something like that looking at the picture above. We had a nice University program in an amphi-theatre right in the heart of the action the students were predominantly of African origin and our kirtan rocked the house. Many of the students later also came to the temple. 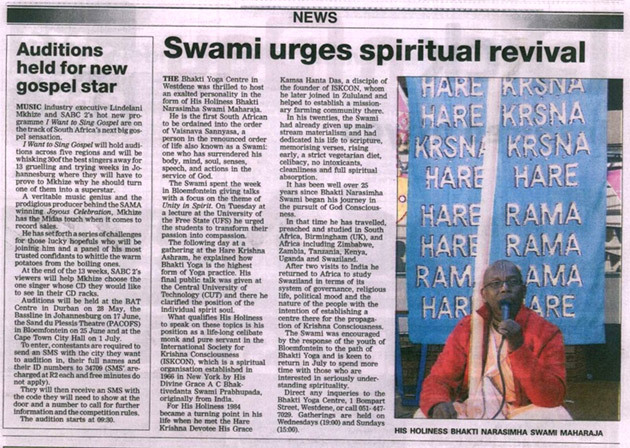 Recently Bhakti Nrsimha Maharaja the first South African sannyasi also visited Bloemfontein as was reported in the local news. 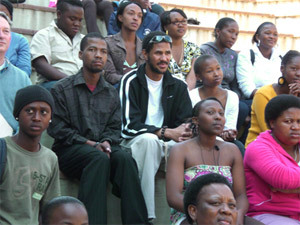 In short Bloemfontein is a place to visit, a place to support. I hope that more devotees will visit our new Bloemfontein centre, there is space for guests. Besides all the good news, it is also quite a struggle to meet ends. We did a program in Kimberly, the famous diamond town 11 hour drive away, we met very nice people but got no diamonds, just covered the gas. On the way from Bloem to Jo’burg the old Mercedez knocked out…..
All glories to Srila Prabhupada and all glories to you, one of his dear most servants. Thank you for the very nice things that you have written about our humble effort of service in Bloemfontein. For the record, the time that I spent preaching in Soweto was from late 1987 to 1989 which was before the collapse of Apartheid (at that time it was illegal for a white person to live in Soweto, but we did so in the effort to preach). 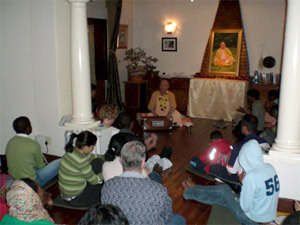 We opened a preaching centre in Mahaprabhu Prabhu’s house which to this day remains the only preaching centre in Soweto. Also in Bloemfontein besides the regular programs you mentioned we also have a weekly Sunday afternoon program. I must say that all inspiration to attempt the service that we have undertaken comes from the great example of sannyasi’s such as your good self. Inspiration also comes from so many other great devotees who have been merciful to me and who give me their blessings. Your visits to Bloem have been greatly encouraging and we pray that you may bless us by visiting many more times in the future.